The LNER Class A3 Pacific steam locomotive No. 4472 Flying Scotsman became the first Steam Locomotive to officially exceed 100mph on November 30 1934. The Flying Scotsman was built in 1923 for the London and North Eastern Railway (LNER) at Doncaster Works to a design of H.Nigel Gresley. It was employed on long-distance express trains on the LNER and its successors, British Railways Eastern and North-Eastern Regions, notably on the 10am London to Edinburgh Flying Scotsman train service after which it was named.The locomotive is notable for having set two world records for steam traction; becoming the first steam locomotive to be officially authenticated at reaching 100 miles per hour (160.9 km/h) on 30 November 1934,and then setting a record for the longest non-stop run by a steam locomotive when it ran 422 miles (679 km) on 8 August 1938. It was retired from regular service in 1963 after covering 2,076,000 miles (3,341,000 km),Flying Scotsman gained considerable fame in preservation under the ownership of Alan Pegler, William McAlpine, Tony Marchington and finally the National Railway Museum. As well as hauling enthusiast specials in the United Kingdom, the locomotive toured extensively in the United States (from 1969 to 1973) and Australia (from 1988 to 1989).Flying Scotsman has been described as the world’s most famous steam locomotive. The locomotive was completed in 1923, construction having been started under the auspices of the Great Northern Railway (GNR). It was built as an A1, initially carrying the GNR number 1472, because the LNER had not yet decided on a system-wide numbering scheme’ Flying Scotsman was something of a flagship locomotive for the LNER. It represented the company at the British Empire Exhibition at Wembley in 1924 and 1925. Before this event, in February 1924 it acquired its name and the new number of 4472. From then on it was commonly used for promotional purposes.With suitably modified valve gear, this locomotive was one of five Gresley Pacifics selected to haul the prestigious non-stop Flying Scotsman train service from London to Edinburgh, hauling the inaugural train on 1 May 1928. For this the locomotives ran with a new version of the large eight-wheel tender which held 9 tons of coal. This and the usual facility for water replenishment from the water trough system enabled them to travel the 392 miles (631 km) from London to Edinburgh in eight hours non-stop. The tender included a corridor connection and tunnel through the water tank giving access to the locomotive cab from the train to permit replacement of the driver and fireman without stopping the train. The following year the locomotive appeared in the film The Flying Scotsman. On 30 November 1934, running a light test train, 4472 became the first steam locomotive to be officially recorded at 100 mph (160.9 km/h) and earned a place in the land speed record for railed vehicles; the publicity-conscious LNER made much of the fact. In 1963 Flying Scotsman Number 60103 finished working. A Proposal to save it was made by a group called “Save Our Scotsman”, they were unable to raise the required £3,000. Luckily Alan Pegler, Having first seen the locomotive at the British Empire Exhibition in 1924, bought Flying Scotsman using money he had received for his share holding when Northern Rubber was sold to Pegler’s Valves. He spent the next few years spending large amounts of money having the locomotive restored at Doncaster Works as closely as possible to its LNER condition: the smoke deflectors were removed; the double chimney was replaced by a single chimney; and the tender was replaced by one of the corridor type with which the locomotive had run between 1928 and 1936. It was also repainted into LNER livery, although the cylinder sides were painted green, whereas in LNER days they were always black. Peglar then persuaded the British Railways Board to let him run enthusiasts specials, And it worked a number of rail tours, including a non-stop London–Edinburgh run in 1968 – the year steam traction officially ended on BR. Then in September 1966 Pegler purchased a second corridor tender, and adapted as an auxiliary water tank; retaining its through gangway, this was coupled behind the normal tender. In October 1988 the locomotive arrived in Australia to take part Australia’s bicentenery celebrations as a central attraction in the Aus Steam ’88 festival. During the course of the next year it travelled more than 45,000 kilometres (28,000 mi) over Australian rails, concluding with a return transcontinental run from Sydney to Perth via Alice Springs. Other highlights included Flying Scotsman double-heading with NSWGRPacific locomotive 3801, a triple-parallel run alongside broad gauge Victorian Railways R class locomotives, parallel runs alongside South Australian Railways locomotives 520and 621, and a reunion with GWR 4073 Class Pendennis Castle in Perth. 8 August 1989 Flying Scotsman set another record en route to Alice Springs from Sydney, travelling 679 kilometres (422 mi) from Parkes to Broken Hill non-stop, the longest such run by a steam locomotive ever recorded. A plaque on the engine records the event. Returned to the UK, by 1995 it was in pieces at Southall Railway Centre in West London, owned by a consortium that included McAlpine as well as music guru and well-known railway enthusiast Pete Waterman. Facing an uncertain future owing to the cost of restoration and refurbishment , salvation came in 1996 when Dr Tony Marchington, bought the locomotive, and had it restored over three years to running condition at a cost of £1 million. Sadly in September 2003 Marchington was declared bankrupt and CEO Peter Butler stated that the company only had enough cash to trade until April 2004. The locomotive was bought in April 2004 by the National Railway Museum in York, and it is now part of the National Collection. it ran for a while to raise funds for its forthcoming 10-year major boiler recertificationn In January 2006, Flying Scotsman entered the Museum’s workshops for a major overhaul to return it to Gresley’s original specification and renew its boiler certificate. 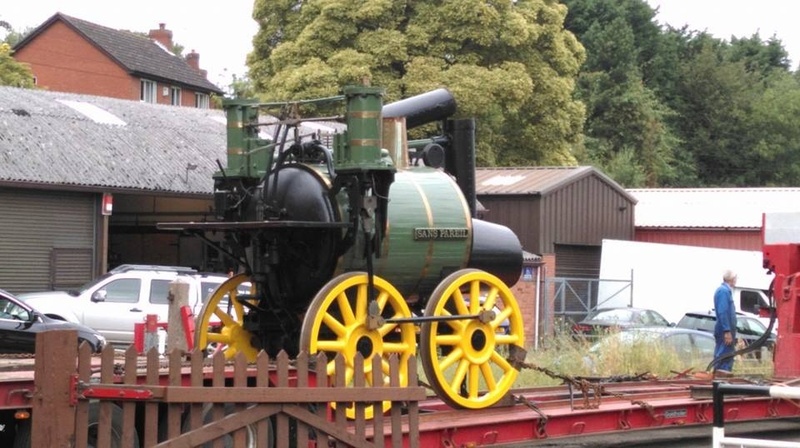 In 2013 The locomotive was moved to Bury work to return it to running condition by 2015. Sadly this took longer than expected because the repairs proved prohibitively expensive and at one time Flying Scotsman’s future looked uncertain. However The rebuilt LNER 4472 Flying Scotsman has visited a number of events since, including the Severn Valley Railway for the Pacific Power event alongside LNER A1 Pacific 60163 Tornado during 2016 and it continues to be a big crowdpleaser. Charismatic Engineer, Steeplejack and British television personality Fred Dibnah tragically died on 7 November 2004. He was Born 28th April 1938 near Bolton. As a child, Dibnah was fascinated by the steam engines which powered the many textile mills in his home town of Bolton and developed a keen interest in mechanical engineering, Steam Engines and chimneys and the men who worked on them. He began his working life as a joiner, before becoming a steeplejack. From age 22, he served for two years in the armed forces, as part of his national service. Once demobilised, he returned to steeplejacking but met with limited success until he was asked to repair Bolton’s parish church. The resulting publicity provided a welcome boost to his business, ensuring he was almost never out of work. Dibnah’s interest in steam power stemmed from his childhood observations of the steam locomotives on the nearby railway line, and his visits to his father’s workplace—a bleach works in Bolton—where he was fascinated by the steam engines used to drive the line shafting. He later became a steam enthusiast, befriending many of the engine drivers and firemen who worked on the nearby railway. As a teenager he met a driver who invited him onto the footplate of his locomotive and who asked him to keep the boiler supplied with fuel. Dibnah became so enamoured with steam engines that he eventually looked for one he could buy. He learnt of a steamroller kept in a barn near Warrington and which the owners had bought from Flintshire County Council. He had the boiler pressure-tested and, despite it being in poor condition, bought it for £175. He towed it to a friend’s house, spent a fortnight making various repairs and drove it to his mother’s house in Bolton. After he married and bought his own property on Radcliffe new Road, he cut an access road to the garden of his new house and moved the steamroller there. Restoring the engine took many years, as Dibnah had to create his own replacement parts, using Victorian engineering techniques and equipment he built in his garden. The boiler was in poor condition and needed serious work, but Dibnah used local knowledge and was eventually able to build a new boiler. 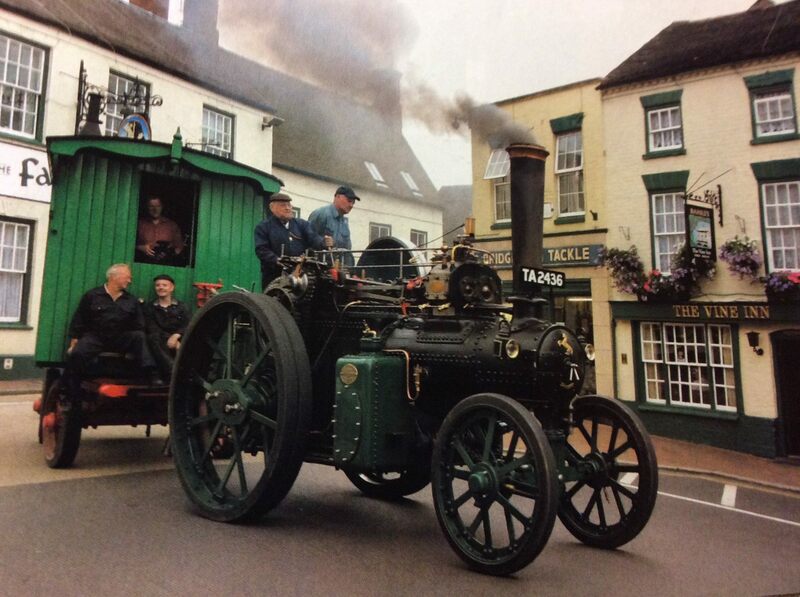 Once restored, he used the 1910 Aveling & Porter steamroller together with a living van he bought and restored, to take his family around the local steam fairs In 1978, while making repairs to Bolton Town Hall, Dibnah was filmed by a regional BBC news crew. The BBC then commissioned an award-winning documentary, which followed the rough-hewn steeplejack as he worked on chimneys, interacted with his family and talked about his favourite hobby—steam. He made many more Television programmes about Steam Engines & Locomotives and In 1998, he presented a programme on Britain’s industrial history and went on to present a number of fascinating series, largely concerned with the Industrial Revolution and its mechanical and architectural legacy. In mid-2000, Dibnah was awarded an honorary degree of Doctor of Technology for his achievement in engineering by Robert Gordon University in Aberdeen, and on 19 July 2004 he was made an honorary Doctor of the University by the University of Birmingham. He was also awarded an MBE for services to heritage and broadcasting. He said “I’m looking forward to meeting the Queen but I shall probably have to get a new cap. And I’d like to meet Prince Charles because we share the same views about modern architecture.”On 7 July 2004, Dibnah went to Buckingham Palace to receive his award from the Queen. Sadly Fred’s health was failing at this point although filming continued at various locations around the country, with sons Jack and Roger, who had become essential members of the tour, providing much-needed support for their father. By the end of July, the crew had filmed only 34 days with Dibnah, out of a planned 60. It was becoming more difficult by the day for Dibnah to fulfil his filming duties and the crew decided to cut short the schedule and he died shortly after and is sadly missed. He is survived by his five children from three marriages. This years Horseless Carriage Day Takes place on Friday, October 26, 2018. Horseless carriage is an early name for the motor car or automobile. Prior to the invention of the motor car, carriages were usually pulled by animals, typically horses. The term can be compared to other transitional terms, such as wireless phone. These are cases in which a new technology is compared to an older one by describing what the new one does not have. Most horseless carriages are notable for their similarity to existing horse-drawn carriages, but with some type of mechanical propulsion. Many of the first horseless carriages include tiller steering, an engine under the floorboards, and a high center of gravity. In the 19th century, steam engines became the primary source of power for railway locomotives and ships, and for powering processes in fixed installations such as factories. 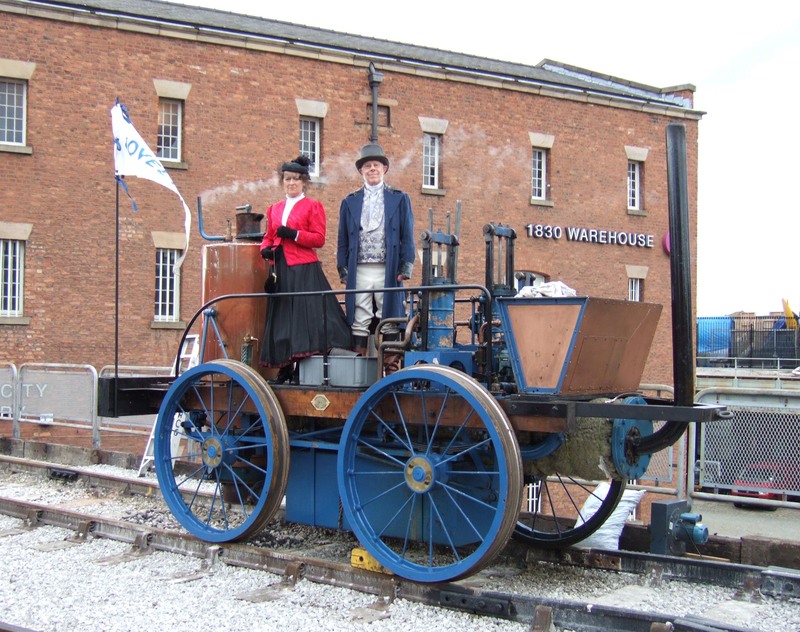 In 1803, what is said to have been the first horseless carriage was a steam-driven vehicle demonstrated in London, England, by Richard Trevithick. In the 1820s, Goldsworthy Gurney built steam-powered road vehicles. One has survived to be on display at Glasgow Museum of Transport. 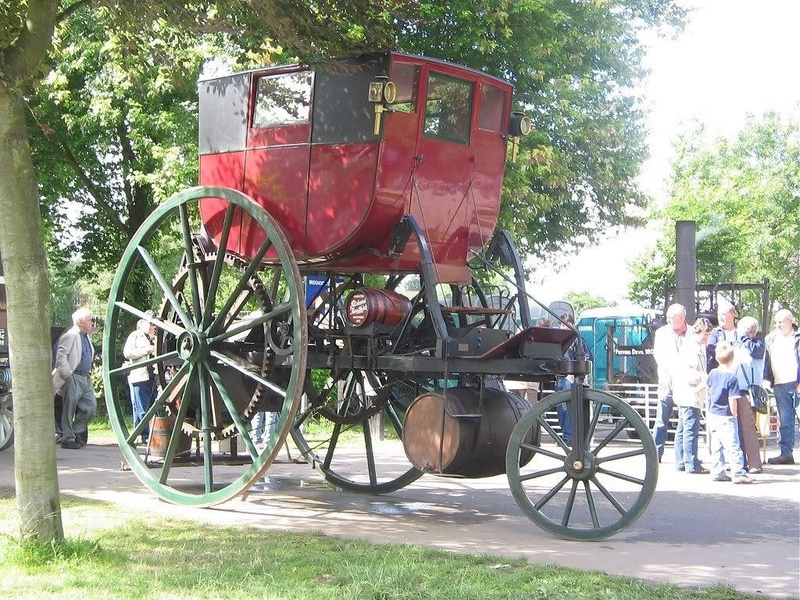 In the United States, a four-wheel steam carriage was made by Sylvester H. Roper in 1863. The 1896 Armstrong horseless carriage is notable as an early hybrid vehicle, with combined an electric motor with battery and gasoline-fueled internal-combustion engine. In 1893, Frank Duryea is reported to have made the first horseless carriage trip on U.S. roads, in Springfield, Massachusetts, traveling approximately 600 yards (550 m) before engine problems forced him to stop and make repairs. He went on to found the first U.S. car company, the Duryea Motor Wagon Company, with his brother. In 2016, horseless carriages from the turn of 19th and the early 20th centuries were featured in a re-creation of the first London Motor Show show in 1896. The Montparnasse derailment occurred on 22 October 1895 after theGranville–Paris Express overran the buffer stop at its Gare Montparnasse terminus. With the train several minutes late and the driver trying to make up for lost time, it entered the station too fast and the train Westinghouse air brake failed. After running through the buffer stop, the train crossed the station concourse and crashed through the station wall before falling 10 metres (33 feet) onto the Place de Rennes below, where it stood on its nose. A woman in the street below was killed by falling masonry. The driver was fined 50 francs and one of the guards 25 francs.The train was outside the station in this position for several days and a number of photographs were taken. At least one photograph is out of copyright and is used as the cover page of a book by John Taylor and on the front cover of Mr. Big’s album, Lean into It. On 22 October 1895 the Granville to Paris express was composed of steam locomotive No. 721 hauling two baggage vans, a post van, six passenger carriages and a baggage van. The train had left Granville on time at 8:45 am, but was several minutes late as it approached its Paris Montparnasse terminus with 131 passengers on board. Trying to make up lost time the train entered the station too fast, at a speed of 40–60 kilometres per hour (25–37 mph), and theWestinghouse air brake failed. Without sufficient braking the momentum of the train carried it slowly into the buffers, and the locomotive crossed the almost 30-metre (100 ft) wide station concourse, crashing through a 60-centimetre (2 ft) thick wall, before falling onto the Place de Rennes 10 metres (33 ft) below, where it stood on its nose. A woman in the street below was killed by falling masonry; and two passengers, the fireman, two guards and a passerby in the street sustained injuries. The woman, Marie-Augustine Aguilard by name, had been standing in for her husband, a newspaper vendor, while he went to collect the evening papers. The railway company paid for her funeral and provided a pension to care for their two children. The locomotive driver was fined 50 francs for approaching the station too fast. One of the guards was fined 25 francs as he had been preoccupied with paperwork and failed to apply the handbrake. The passenger carriages were undamaged and removed easily. It took forty-eight hours before the legal process and investigation allowed the railway to start removing the locomotive and tender. An attempt was made to move the locomotive with fourteen horses, but this failed. A 250 tonne winch with ten men first lowered the locomotive to the ground and then lifted the tender back in to the station. When the locomotive reached the railway workshops it was found to have suffered little damage. The train was outside the station for several days and a number of photographs were taken, such as those attributed to Studio Lévy and Sons, L. Mercier, and Henri Roger-Viollet. The Lévy and Sons photograph is out of copyright and is used as the cover page in the book An Introduction to Error Analysis by John Taylor. The picture is also featured on the front cover of American hard rock band Mr. Big’s 1991 album, Lean into It. It also appears as a dream in the novel The Invention of Hugo Cabret and its film adaptation, Hugo. It is referenced in the television series Thomas and Friends in “A Better View For Gordon” and depicted in the comic book The Extraordinary Adventures of Adèle Blanc-Sec. 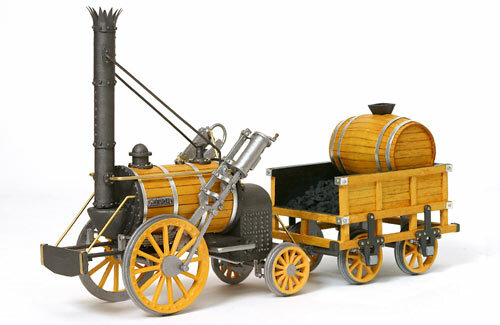 Stephenson’s early locomotive “Rocket” won the Rainhill Trials On 8 October 1829 . Stephenson’s Rocket was an early steam locomotive of 0-2-2 wheel arrangement, built in 1829 at the Forth Street Works of Robert Stephenson and Company in Newcastle Upon Tyne, specially for the Rainhill Trials held by the Liverpool & Manchester Railway in 1829 to choose the best design to power the railway. Though the Rocket was not the first steam locomotive, it brought together several innovations to produce the most advanced locomotive of its day and became the template for most steam engines in the following 150 years. It had a tall smokestack chimney at the front, a cylindrical boiler in the middle, and a separate firebox at the rear. The large front pair of wooden wheels was driven by two external cylinders set at an angle. The smaller rear wheels were not coupled to the driving wheels, giving an 0-2-2 wheel arrangement. As the first railway intended for passengers more than freight, the rules emphasised speed and would require reliability, but the weight of the locomotive was also tightly restricted. Six-wheeled locomotives were limited to six tons, four-wheeled locomotives to four and a half tons. In particular, the weight of the train expected to be hauled was to be no more than three times the actual weight of the locomotive. Stephenson realised that whatever the size of previously successful locomotives, this new contest would favour a fast, light locomotive of only moderate hauling power. His most visible decision was to use a single pair of driving wheels, with a small carrying axle behind giving a 0-2-2 arrangement. The use of single drivers gave several advantages. The weight of coupling rods was avoided and the second axle could be smaller and lightweight, as it only carried a small proportion of the weight. Rocket placed 2½ tons of its 4¼ ton total weight onto its driving wheels,a higher axle load than the rival locomotive Sans Pareil, even though the 0-4-0 was heavier overall at 5 ton, and officially disqualified by being over the 4½ ton limit. Stephenson’s past experience convinced him that the adhesion of the locomotive’s driving wheels would not be a problem, particularly with the light trains of the trials contest. Rocket uses a multi-tubular boiler design. Previous locomotive boilers consisted of a single pipe surrounded by water. Rocket has 25 copper fire-tubes that carry the hot exhaust gas from the firebox, through the wet boiler to the blast pipe and chimney. This arrangement resulted in a greatly increased surface contact area of hot pipe with boiler water when compared to a single large flue. Additionally, radiant heating from the enlarged separate firebox helped deliver a further increase in steaming and hence boiler efficiency.The advantages of the multiple-tube boiler were quickly recognised, even for heavy, slow freight locomotives. By 1830, Stephenson’s past employee Timothy Hackworth had re-designed his return-flued Royal George as the return-tubed Wilberforce class. Rocket also used a blastpipe, feeding the exhaust steam from the cylinders into the base of the chimney so as to induce a partial vacuum and pull air through the fire. .the blastpipe worked well on the multi-tube boiler of Rocket but on earlier designs with a single flue through the boiler it had created so much suction that it tended to rip the top off the fire and throw burning cinders out of the chimney, vastly increasing the fuel consumption. Like the Lancashire Witch, Rocket had two cylinders set at angle from the horizontal, with the pistons driving a pair of 4 ft 8.5 in (1.435 m) diameter wheels. Most previous designs had the cylinders positioned vertically, which gave the engines an uneven swaying motion as they progressed along the track. Subsequently Rocket was modified so that the cylinders were set close to horizontal, a layout that influenced nearly all designs that followed. The cylinders were also connected directly to the driving wheels, an arrangement which is found in all subsequent steam locomotives.The firebox was separate from the boiler and was double walled, with a water jacket between them. This firebox was heated by radiant heat from the glowing coke, not just convection from the hot exhaust gas.Locomotives of Rocket’s era were fired by coke rather than coal. Local landowners were already familiar with the dark clouds of smoke from coal-fired stationary engines and had imposed regulations on most new railways that locomotives would ‘consume their own smoke’. The smoke from a burning coke fire was much cleaner than that from coal. It was not until thirty years later and the development of the long firebox and brick arch that locomotives would be effectively able to burn coal directly.Rocket’s first firebox was of copper sheet and of a somewhat triangular shape from the side. The throatplate was of firebrick, possibly the backhead too. When the Liverpool and Manchester Railway was approaching completion, the directors of the railway ran a competition to decide whether stationary steam engines or locomotives would be used to pull the trains. So the Rainhill Trials were run in October 1829 in Rainhill,Lancashire (now Merseyside) they featured several tests for each locomotive which were performed over the course of several days. The Rainhill stretch of the Railway was very level for approximately a mile and considered a perfect site for the Trials. The Rainhill Trials were arranged as an open contest that would let them see all the locomotive candidates in action, with the choice to follow. Regardless of whether or not locomotives were settled upon, a prize of £500 was offered to the winner of the trials. Three notable figures from the early days of engineering were selected as judges: John Urpeth Rastrick, a locomotive engineer of Stourbridge, Nicholas Wood, a mining engineer from Killingworth with considerable locomotive design experience and John Kennedy, a Manchester cotton spinner and a major proponent of the railway Locomotives were run two or three per day, and several tests for each locomotive were performed over the course of several days.The Rainhill stretch of the Railway was very level for a mile or so: a perfect site for the Trials. The locomotive Cycloped was the first to drop out of the competition. Built with “legacy technology”, it used a horse walking on a drive belt for power, and was withdrawn after an accident caused the horse to burst through the floor of the engine.Next to retire was Perseverance. Damaged en route to the competition, Burstall spent five days repairing it. When it failed to reach the required 10 miles per hour (16 km/h) on its first tests the next day, it was withdrawn from the trial. It was granted a £26 consolation prize. Sans Pareil nearly completed the trials, though at first there was some doubt as to whether it would be allowed to compete as it was 300 pounds (140 kg) overweight. However, it did eventually complete eight trips before cracking a cylinder. Despite the failure it was purchased by the Liverpool & Manchester, where it served for two years before being leased to theBolton and Leigh Railway. The last engine to take part was Novelty. In complete contrast to Cycloped it was cutting-edge for 1829, lighter and considerably faster than the other locomotives in the competition. It was accordingly the crowd favourite. Reaching a then-astonishing 28 miles per hour (45 km/h) on the first day of competition, it later suffered some damage to a boiler pipe which could not be fixed properly on site in the time allotted. Nevertheless it continued its run on the next day, but upon reaching 15 mph the pipe gave way again and damaged the engine severely enough that it had to drop out. Consequently, the Rocket was the only locomotive to complete the trials. It averaged 12 miles per hour (19 km/h) (achieving a top speed of 30 miles per hour (48 km/h)) hauling 13 tons, and was declared the winner of the £500 prize. The Stephensons were accordingly given the contract to produce locomotives for the Liverpool & Manchester Railway. In 1980 the Rocket 150 celebration was held to mark the 150th Anniversary of the trials. A replica of Novelty was built for the event, which was also attended by replicas of Sans Pareil and Rocket (plus coach).The Rocket replica bent its axle in Bold Colliery railway sidings during the event and was exhibited on a low loader carriage.The event was also attended by:Lion, at the time of Rocket 150 the oldest operable steam locomotive in existence. Flying Scotsman No. 4472, LMS 4-6-0 Jubilee class No. 5690 Leander, Sir Nigel Gresley No. 4498, GWR 0-6-0 No. 3205, lMS Class 4 MT 2-6-0 No 43106, BR 92220 Evening Star, the last steam locomotive to be built by British Railways,LMS 4-6-2 Princess Elizabeth No. 6201, Class 86 locomotives 86214, Sans Pareil and 86235. In a recent (2002) restaging of the Rainhill Trials using replica engines, neither Sans Pareil nor Novelty completed the course. In calculating the speeds and fuel efficiencies, it was found that Rocket would still have won, as its relatively modern technology made it a much more reliable locomotive than the others. Novelty almost matched it in terms of efficiency, but its firebox design caused it to gradually slow to a halt due to a build up of molten ash (called “clinker”) cutting off the air supply. The restaged trials were run over a section of line in Llangollen, Wales, and were the subject of a BBC Timewatch documentary. To celebrate the fiftieth anniversary of The Severn Valley Railway and the 50th year of the class 50 Diesel locomotive there is a Class 50 Diesel Golden Jubilee event from October 4th to 6th at the Severn Valley Railway in conjunction with The Class 50 Alliance. The British Rail Class 50 was a class of 50 diesel locomotives designed to haul express passenger trains at 100mph. Built by English Electric at the Vulcan Foundry in Newton-le-Willows between 1967 and 1968, the Class 50’s were initially on a 10-year lease from English Electric Leasing, and were employed hauling express passenger trains on the, then non-electrified, section of the West Coast Main Line between Crewe and Scotland. Initially numbered D400 – D449 and known as English Electric Type 4s, the locomotives were purchased outright by British Rail (BR) at the end of the lease and became Class 50 in the TOPS renumbering of 1973. The class were nicknamed “Hoovers” by rail enthusiasts because of the distinctive sound made by the dynamic braking resistor cooling fan arrangement (removed at refurbishment). Once the electrification from Crewe to Glasgow was completed the locomotives were moved to the South West of England to allow the retirement of the remaining diesel-hydraulic locomotives then in use. As these trains steadily moved to High Speed Train operation from 1976, the Class 50s moved to hauling trains between London Waterloo and Exeter St Davids, and also trains from London Paddington to Hereford and Worcester via Oxford. The class was steadily retired from service in the late 1980s and early 1990s as their services moved to operation by second-generation DMUs. The prototype was deemed successful and negotiations took place with English Electric for a production batch of 50 locomotives for use on the Eastern Region English Electric intended to build the new batch as similar to DP2 as possible but the British Railways Board (successor to the BTC) had produced a standard locomotive cab with a flat front and headcode box and also had specific requirements relating to the engine room and other equipment. English Electric produced several alternative front-end designs including one with a wrap-around windscreen but the standard front-end design was eventually adopted for the class. The complete production run of 50 locomotives was built in just over a year and numbered from D400 to D449. D400 entered service in October 1967 and deliveries were completed with D449 in November 1968 Unusually, the ownership of the locomotives remained with the manufacturer and they were operated by British Rail on a 10-year lease which included certain stipulations relating to availability The D prefix was quickly dropped as for all diesel locos after steam had disappeared in 1968. The locos ran as 400 to 449 from 1969 to 1974. In 1984, 50007 Hercules was repainted into lined Brunswick green livery and renamed Sir Edward Elgar, to commemorate the 150th anniversary of the Great Western Railway (GWR). From 1987, the class was used on freight trains. So 50049 “Defiance” was renumbered to 50149, equipped with modified Class 37, lower-geared bogies and outshopped in the new trainload grey livery with Railfreight General decals. During the 1990s, the reliability of the fleet became a problem again so the fleet was retired and, temporarily replaced with Class 47/7 locomotives,then by new Diesel Multiple Units. By 1992, just eight locomotives remained in servic Nos:50007/50008/50015/50029/50030/50033/50046/ 50050. Several of these locomotives were specially repainted to commemorate the run-down of the fleet. The first-built locomotive, 50050 Fearless was renumbered D400 and painted in its original BR Blue livery. Two other locomotives, 50008 Thunderer and 50015 Valiant were also repainted, the former in a variation of BR Blue. Of the final eight locomotives, three were retained until 1994 for use on special railtours, these being 50007 Sir Edward Elgar, 50033 Glorious and 50050 Fearless. 50007 was returned to working order. 50050 was repainted into Large Logo livery and 50007 was repainted into GWR green. Locomotives attending the event include class 50 50007 Hercules, Garcia Hanson’s 50008 Thunderer, 50011 Centurion, 50035 Ark Royal, 50031 Hood, 50044 Exeter, 50015 Valiant, Neil Boden’s 50017 Royal Oak and Paul Spracklen’s 50026 Indomitable , 50049 Defiance and 50050 (D400) Fearless.